How Data is Stored in JotForm if Email Notification also Sends a copy of it? I only want to receive the submitted data via email so that it is not stored on a server anywhere. Is that possible? Ideally I'd want to also receive it in some kind of file, e.g. csv, xml, etc so that I could then use the data internally on our own servers. Is this possible? We are a financial services industry and wouldn't be able to use Jot forms if the data was stored for any length of time. All data captured by the form you created will be stored to our servers, our cloud servers are highly secured and all storage are stored and encrypted for protection. If you are still concerned about the security, you can use our SSL-enabled forms which provides secure communication between the one using the form and JotForm's servers, you can learn more about it here: http://www.jotform.com/help/63-How-can-I-receive-SSL-Submissions. The actual encryption strength on a secure connection using a digital certificate is determined by the level of encryption supported by the user's browser and the server that the website resides on. For example, the combination of a Firefox browser and an Apache Web server normally enables up to 256-bit AES encryption with our SSL certificates. This means that depending on the Web browser and Web server that combine to establish the secure connection through one of our SSL certificates, the encryption strength of the secure connection may be 40, 56, 128, or 256 bit. If you are still worried, you can delete the submission data in your account, but before doing this I recommend that you download the submissions first, and yest you can download them in excel, CSV and PDF format. You can follow the screenshot below. 1. Navigate to My Forms->Choose a form with submissions->Click the "Submissions" menu. 2. 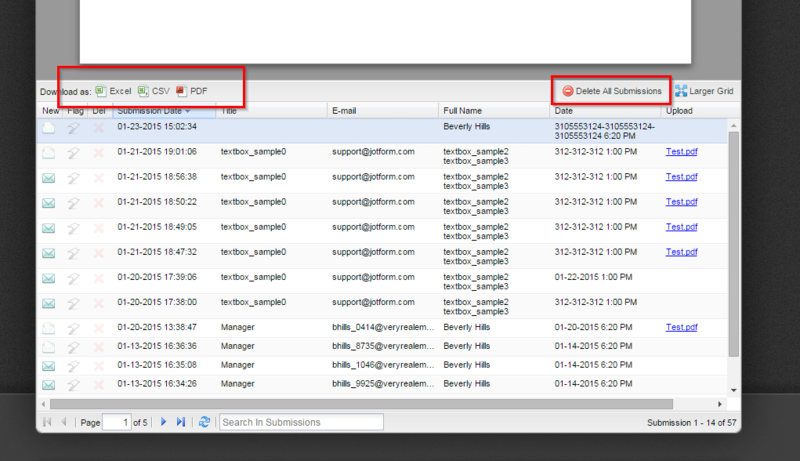 Inside the Submissions page, you can edit or delete the submissions. When you scroll down and view the grid list you'll see the download options. Please do take note that when you delete a submission, you won't be able to recover it. I hope this helps. I would recommend that you register an account so that you can fully utilize our product and services.